I’ve had a Twitter account for about two years, but I was only using it to follow a few people and research. This afternoon I decided that was a waste of a Twitter account. I’m planning to use Twitter in conjunction with the blog to tackle more subjects, and share information. I don’t foresee me using it to announce the inane details of my life. 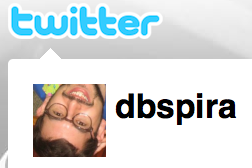 You can find me @dbspira. What Documents Should I Keep? How Do I Destroy The Rest? Now you can double your traffic in just maybe a couple days.